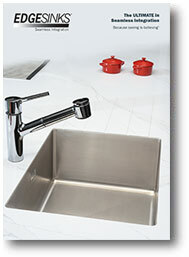 We are delighted to announce the launch of our new PRO Kitchen Sink Range here. EdgeSinks™ - the only stainless steel sink that can be integrated seamlessly into a multiple of worktop surfaces. The ultimate in Hygiene, Edge is easy to install & suitable for domestic, commercial & medical application. Visually stunning, EdgeSinks™ are also practical, eliminating all traditional issues of soft seal joints, worktop over & under hangs, creating a new standard of expectation in our industry. EdgeSinks™ can be installed in solid surface, core tops, hardwood, quartz, ceramic, marble, compact laminate & laminate.